I really love the idea of this book. To pair up people in the book community with bestselling authors is such a cool idea. I really appreciated the recognition of vloggers/reviewers as important contributors in the book world. I’ve seen some people have issues with the Booktubers being involved in the book but I personally have no hard feelings towards them. I think it’s really cool for them and it’s too bad that others are holding negative feelings towards them just because they’re successful in an unconventional way. The stories themselves are pretty hit and miss with me. There was a few that I really loved but others I didn’t like and skimmed over them. My favorite stories were Beautiful Venomby Cindy Pon and Benjamin Alderson and Death Knell by Victoria Schwab and Jesse George. I think this book is worth reading just for those two stories, especially Cindy and Ben’s story. Overall, this book was pretty much what I was expecting. 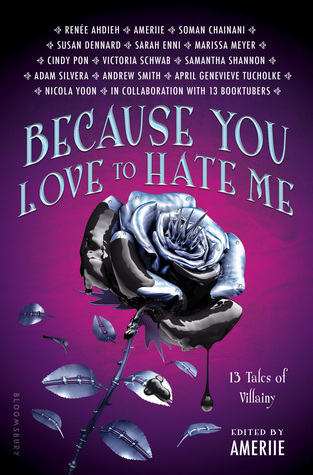 I feel like a lot of short story collections are hit and miss with most people so it didn’t surprise me that Because You Love to Hate Me was no exception to that for me. If you’re really excited about this book and love the authors and Booktubers, I think this is worth buying. If you’re a very casual fan, like myself, you might want to go to your local library or borrow it from a friend before spending your money.